I'd like to invite visitors to Help Readers Love Reading! - new folks and the regulars alike - to visit my new site, simply called Help Readers Too!. It's an irregularly updated, miscellaneously contented, sister site. More details are available over there ... well, a few anyway ... but basically it's a place for additional thoughts and opinions that aren't necessarily book reviews. I'd also like to invite readers, especially teachers and bloggers, to weigh in on a moral dilemma I recently posted involving a highly anticipated book and its release date. If you feel like clicking on over today or another time, thanks. It's pretty sparse right now, and I plan on tidying up a bit in the future, but I wanted to post this story before it became irrelevant. And thanks again for visiting Help Readers Love Reading!. 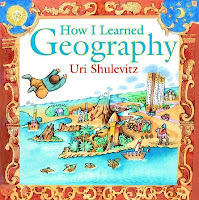 Great books are like a hike up a steep hill with a spectacular view. The heart rate climbs. Breathing quickens. The desire to finish grows, along with the effort put forth to reach that end. And the payoff is remarkable. The Graveyard Book does all these things. I’ve read and reread and considered it greatly for this review. The more I do, the more I’m convinced Neil Gaiman’s book is an incredible choice for the 2009 Newbery Medal. As I read The Graveyard Book, I felt there were four distinct parts. Part One: Chapter 1, How Nobody Came to the Graveyard, begins with the creepiest opening in recent memory. "There was a hand in the darkness, and it held a knife." The whole page is black, save the chapter title, that one line of text, and the knife-wielding hand. A baby boy, 18 months old, has crawled out of his bed. He proceeds down the stairs, through the front door, into the street, and up the hill to protective hands of the graveyard residents. His family is murdered by the man Jack. The boy is unharmed. Part Two: Chapters 2-5 each read as a short story - indeed, Chapter 4, The Witch's Headstone, was first published as a short story - and each chapter gives important information about the boy's life in the graveyard. 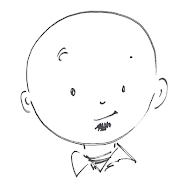 Adopted by Mr. and Mrs. Owens, longtime occupants of the graveyard, and looking like nobody in particular, the boy becomes Nobody Owens, Bod for short. Five-year-old Bod meets a friend, Scarlett, who is visiting the graveyard, now more park than cemetary. Readers learn the differences between a normal child and one granted the Freedom of the Graveyard. Readers are also introduced to the Sleer, an ancient graveyard resident. Six-year-old Bod is introduced to this graveyard’s ghoul-gate (every graveyard has a ghoul-gate), what lies beyond the gate, and the lengths to which the dead will go to preserve his life. A ten-year-old Bod meets a resident witch and begins a friendship. He continues his education, both academic and spiritual. He witnesses and participates in the Danse Macabre. Part Three: A brief interlude, The Convocation, reminds readers that the man Jack still exists and still wants – needs, in fact – Bod dead. His business associates, for lack of a better term, remind him of his failure and responsibility to finish the business he started. Part Four: Chapters 6-8 read more as the novel I expected. Bod makes more and more excursions into the world outside the graveyard where, for the most part, he is unprotected. He goes to school, meets bullies, new friends, old friends, and police officers. But all these outside experiences, though beneficial to a boy quickly becoming a young man, make it increasingly difficult for Bod to remain anonymous and hidden from the man Jack. Anticipation that steadily builds and an inescapable sense of dread work together so readers don’t see the climax coming as much as they feel it coming. So get yourself a copy of The Graveyard Book, block out a chunk of time, and set your bookmark aside. And make sure the lights are on. Brightly. I don't think Lincoln and His Boys offers too much new or relatively unknown information about Abraham Lincoln, but it does offer a perspective I haven't seen before. 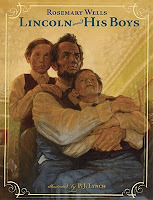 Readers meet President Lincoln through the eyes of his youngest sons, Willie and Tad. The book is divided into three sections: Willie 1859, Willie and Tad 1861, and Tad 1862-1865. Willie, the older of the two brothers, relates the events leading up to his father's election. There's not a lot of historical facts - it's not a history book disguised as a children's book. Yes, it's the events before the election, but not debates and politics. It's a trip to the tailor and a special trip to Chicago with his father. It's keeping a promise to mother to go see Miss Jenny Lind, the best lady singer in the world, for Willie's edification. But it's also about a father who makes time to take his son to see the Chinese acrobats and jugglers at Metropolitan Hall. The second section is again narrated by Willie, but tells of the family's travels to Washington on the train after Lincoln is elected and the events of their first year in Washington. The kids build a fort on the White House roof, complete with log artillery, mostly pointed south. The boys bust into Cabinet meetings and are the only cause of laughter for the president. Tad picks up the narration after the fever that struck both he and Willie leaves his brother dead. His part continues to the end of the war, closing with the two most powerful events - a trip to Richmond immediately after the war's end and the president's command that the army band play Dixie in Washington. Take time to look at the pictures. Study them. Look at the joy on Lincoln's face when he is with his boys. Notice the glares on the faces of Lincoln's Cabinet members at the same time. 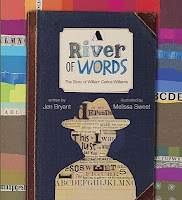 P. J. Lynch's illustrations deserve recognition in any review of Rosemary Wells' wonderful book. New column today. I should have dedicated this one to all the parents who fondly remember Pong and their first 8-Tracks. COLUMN: WiiOnes caught up in world of video games, electronics or here's the printable version. Stinky enjoys his stinky yet simple life. His cave has bats and bugs and a pet toad named Wartbelly. He has an abundant supply of pickled bananas, pickled eggs, and pickled onions. The moment he leaves his cave, his neighbors call him by name. "Hi, Stinky," says the squirrel and dragonfly. "Good morning, Stinky," says the bird and the porcupine. Even the turtle, frogs, and alligator greet Stinky. His swamp has mushy, mucky mud and a bottomless pit and an onion patch and wonderfully stinky smell. Best of all, it’s all his. Ah…home smelly home. Stinky must be careful, however, because on the other side of the swamp is a town. “Towns have kids,” Stinky explains, “and kids don’t like swamps. They like to take baths!” How could a monster befriend anyone who doesn’t like mud or slugs or smelly monsters like him? “I stay away from them,” he declares. Stinky does all he can to avoid kids, but what can he do when a kid wanders onto his territory? A kid! In his swamp! Stinky tries to get rid of the boy. He tries to stink him out with Wartbelly. He steals his hammer and tries scaring him with a ghost costume. Nothing works. Stinky’s final plan? Give up. In his frustration Stinky gets himself into quite a predicament – trapped at the bottom of the bottomless pit! (“Well, maybe not a bottomless pit!” Stinky realizes. “But it’s very deep.”) And who is the only person in the swamp to hear his cries? Yep, it’s the boy, Nick. Now Stinky’s only hope is something he has always tried to avoid. A kid! More specifically, the boy he tried so desperately to run out of his swamp. Eleanor Davis’ book is a great addition to the Toon Book library, and a great addition to any classroom library with emerging readers, especially readers whose likes and dislikes include mushy, mucky mud, slimy slugs, and stinky smells. The events of The Surrender Tree: Poems of Cuba's Struggle for Freedom span 50 years, from the childhood of Rosa and Lieutenant Death to the end of the War for Independence. Rosa is a child who learns the healing powers of the plants of the forest. Lieutenant Death is the son of a slave catcher who learns from his father how to hunt escaped slaves. These two characters share the narration, all told in verse, in Part One (1850-1851). Part Two tells the events of the Ten Years' War (1868-1878), again with Rosa and Lieutenant Death (now adults) sharing narrative duties, adding Jose, Rosa's husband, and two pages from a Lieutenant-General from Spain. Rosa tells of healing the sick and the injured. Lieutenant Death continues his father's job of hunting slaves. Parts Three and Four continue through the the Little War (1878-1880) and the War of Independence (1895-1898). Silvia, a young girl who lost her entire family in a reconcentration camp, is added to the narrative mix, expressing her desires to learn the art of healing from Rosa, now a Cuban legend. Part Five (1898-1899) closes with the events after the War of Independence, telling of Spain's exit, and the United States' involvement and subsequent occupation. Characters are still left with a desire for freedom, feeling they have only exchanged one "foreign tyrant" for another. It's a book about war. All the events you'd think should be in there are there: atrocities, death, murder, revenge, betrayal. There's also Rosa's desire to do good, always good, healing everyone, both friend and enemy, and never accepting payment, for healing comes from God. Events are told in only enough detail so the imagination will fill in the rest, often times with the most gruesome details. I'm not big on filling in gruesome details of war with my imagination. Whether or not The Surrender Tree is a Newbery-quality distinguished book is a debate I'll leave to others. Regardless of the results of their debate, I don't see this book flying off classroom library shelves or being passed student to student. 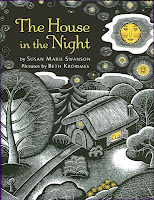 After The House in the Night won the Caldecott Medal, and having just finished a student-selected mock Caldecott with my fourth graders, I read the book aloud to my class. Their response? Shifty sideways glances. A few unintelligible mumbles. Mostly just awkward silence. Finally one brave girl slowly raised her hand and said, "Well, it was kinda boring." Fair enough, I thought. This is the bunch that overwhelmingly favored A Couple of Boys Have the Best Week Ever and Beware of the Frog in our mock election. Plenty of humor, bold pictures, and enough text to keep the ten year old mind interested. One student described The House in the Night as a lullaby (a great observation), gold is the only color, and it has fewer then ten words per page. To be fair, they appreciated it more after we discussed how the pictures were created using scratchboard. Some students pointed out that the bird in the girl's book seemed to grow larger each page until the outline of the bird was incorporated into the other illustrations, then got smaller until it was back in its book. Some saw it, some didn't, but good art does that to the observer, doesn't it? Our art teacher, however, had a different opinion. I showed her the book, and she refused to return it. (It's not even my copy! I got it at the public library.) I saw it the next day, open and upright on a table in the art room, as sixth graders studied the pictures before beginning their own scratchboard projects. They were captivated by the detail and accuracy of the etchings. The House in the Night had found a home in the art room. That shows the Caldecott worthiness of Beth Krommes' illustrations. It also will be at home in the bedroom, just before lights out, as little ones curl up on a parent’s lap to share the girl’s teddy bear, her story, her goodnight kiss, and her good night’s sleep. And that proves the kid worthiness of Susan Marie Swanson's story.